Through its Patents for Humanity Award, the United States Patent and Trademark Office (USPTO) illuminates stories of technologies that are making real change in the world for those most in need. This year, one of those stories is ours to tell. In the developing world, more than 1.5 million children under the age of five die each year from vaccine-preventable diseases. Seven years ago, the Global Good team set out to change this. The team had a vision to help deliver vaccines to rural areas where vaccines are often critical, and power is scarce or nonexistent. 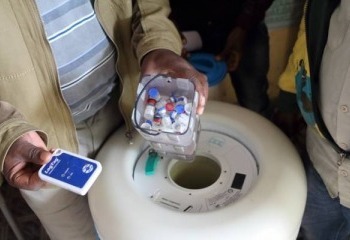 Through the invention of Arktek™ – a device which can keep vaccines cool for more than a month with no power – inventors, rocket scientists, industrial engineers and health experts worked together to turn this vision into a reality. The technology has been transformative for countries with the lowest immunization rates in the world including Ghana, Ethiopia, Senegal and Nigeria. Since the first U.S. patent was issued in 1790, patents have provided the momentum driving the developed world into each era of technological progress. In the modern invention landscape, the Global Good team draws on resources, such as patents, that are often reserved for commercial pursuits in the developed world to lift up those living in our world’s most impoverished countries. At Intellectual Ventures, we celebrate Global Good’s Arktek, along with all inventions developed with the common goal of finding answers to the world’s most pressing questions. Patents have propelled society forward for 226 years and counting and today we celebrate the impact they have on making sure no facet of society is left behind. Many congratulations to the Arktek team and everyone at Global Good for winning this esteemed award. A new study by Global Good and its partners explores how reinventing two common household items—the window and door—could save lives by keeping pesky mosquitoes out of African homes. In a new study published in the journal Icarus, Nathan argues that astronomers don’t have as good a handle on the size and other physical characteristics of asteroids as they previously thought. The World Health Organization-approved eLearning tool can be used regardless of Internet access.